It's been a long battle getting Readability's app approved by Apple. Now that it's out, was it worth the wait? Yesterday we announced the arrival of Readability for iOS with some backstory, but what about the app itself? It's a pure, simple, and beautiful reading experience, particularly for longer articles and in-depth reports. 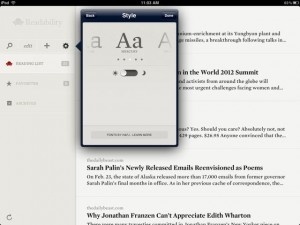 Yes, Readability's app was worth the wait. It's also completely free, so download it. Readbility is a three-year-old web-based service that allows web readers to use browser plug-ins to either convert a web page in real time to a spartan clean view, stripped of ads and other distractions, or save it for offline reading later. It's like curating a personal magazine. The app provides the same service and merges seamlessly with the web versions. Users open to a blank page with just a menu. Filling the app is the the reader's job. Users can search the web or enter an URL manually. The app pulls the article, pretties it up, and places a lead-in on the home screen. I found it faster to just surf on my Mac adding articles that appealed as I found them, but how one fills the app is a small matter. What Readability does with the content is the cool bit. I tested the universal build on an iPad and it works wonderfully in both orientations. In landscape the articles fill the main pane and a well-designed and unobtrusive sidebar has the menu. In portrait the sidebar is a tiny top bar. Each article is noted by source, title and two line lead; a tap opens the reader. 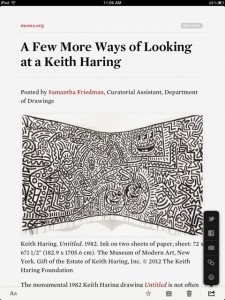 The app has a number of formatting options including a set of beautiful fonts designed by Hoefler & Frere-Jones, and a night-reading mode. As one scrolls down to the end of one article the next loads automatically or a swipe will bring users back to the ersatz table of contents. Posts are easily deleted, archived, marked as a favorite, or shared via Twitter, Facebook and email. Is there room in this market for another player? Resoundingly yes. I spent about 30 minutes looking for content for this review and about the same testing. But, once I settled in with Readability on my iPad, I forget I was "working" and just took pleasure in reading. Like I said up top - download it.